Homefront Blog: One. Million. Cards. NEWS MEDIA: Contact sandy@operationwritehome.org to receive press release or get more info. The OWH family has a big milestone to celebrate today: our ONE MILLIONTH CARD! 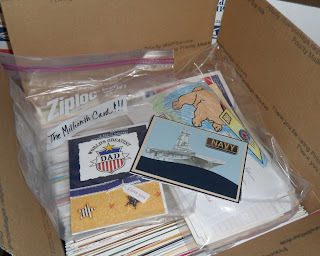 During OWHtv episode 11, our president and tv hostess Sandy began opening packages on-air....to get to the millionth card, mailed on May 13, 2011 to the USS Carl Vinson, 100 more Father's Day cards were needed to fill waiting boxes. The tension built as the count rose...which card would it be?? The viewers in chat were on pins and needles too, judging by their conversation! Watch the video episode below (first 30 minutes). 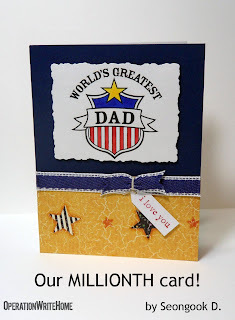 The millionth card, shown here, was made by Seongsook Duncan of Sacramento, CA, one of our long time crafters and bloggers. Her blog is called Seongsook's Creations: Show You Care with Handmade Cards from the Heart and that couldn't be a more appropriate tag line for an OWH blogger! Each of her beautiful cards is made with great love and attention to detail, including this one. This card sports a digi (digital stamp design - a computer file printed and used just like a stamped image) made by another of our longtime supporters, Paula Spagnuolo of Stamford CT, who blogs at Handmade by Paula: Creating Handmade Cards to help America's heroes keep in touch with home. Paula has been very involved with OWH for years, and this digistamp design was created and posted by her on April 30th. Another of our crafters had a hand in this card - that would be Julie Fountain of Shreveport, Louisiana, who blogs at Handmade by Julie: Up to my elbows in ink and paper! Julie posts our weekly sketches - these are design idea-starters that our crafters love to follow each Sunday! The sketch for this card was Sketch #67. And, of course, the shipper sending this card and box is none other than Sandy Allnock of Federal Way, who blogs at A Colourful World! The box to carry this millionth card had already been packed, for its trip to the Post Office! There's a note inside on this Navy card for our Petty Officer serving on the USS Carl Vinson, telling her the story of the card and humbly requesting a photo of the card on board the ship. Our contacts don't always have time to accomodate little requests like this, but we are hopeful the import of the millionth makes it rise to the top! The rest of the box contains 328 handmade cards to write home on, and 20 AnyHero letters in the ziploc bag - these are letters from citizens across the nation, expressing their gratitude and encouragement. The USS Carl Vinson was selected to receive the millionth card because of the role they played in recent international events: the body of Osama bin Laden was respectfully prepared with Islamic rituals on board the ship, then buried at sea. We are so very proud of them for their part in doing this job with such respect, just like everything they do every day. Thank you, Sailors! The box will be mailed at the Twin Lakes Post Office in Federal Way, Washington, to start its journey to the North Arabian Sea. Please join us in celebrating the surpassing of this amazing milestone....watch our celebration video below, and leave a comment here - Please share what making cards for our heroes means to you - tell stories, link to your thoughts posted on your own blog, whatever you'd like! Share this blog post link and our video and spread the good news! Yay!! Congrats on reaching the on Millionth card. I just love making cards for our heros so while they are fighting for my freedom, they can keep in touch with their families. CONGRATULATIONS!!! How exciting it is to be the Heroes to open this box and see they get the Millionth card! Wish we could see the looks on their faces! :) Amazing Job Card makers! WOW, what an amazing milestone! I couldn't be prouder of every member of our OWH family and what we have accomplished in supporting our military and their families in our own unique way. Amazing OWH!!!!! It's hard to wrap my mind around one million cards------job well done!!! I'm so happy I've found this group & have been inspired to start making cards. Hahahah, Sandy, that purple tie-dyed paper was mine!!! I got goosebumps when I heard the news! Congratulations!! 1,000,000 is an amazing milestone. When I make the cards - it's my time to reflect on who they are for. It's just a small token of appreciation for those who put their life on the line protecting our Freedom. My cards didn't make it in time for the first million...but it will be an honor to be part of the SECOND MILLION!!! Thanks Sandy, Dixie & Kris for all you do!! This is just the best news ever. I have always admired Seongsook's cards and am so happy that hers ended up being the millionth card. And it is just the perfect, patriotic Father's Day card too. Sandy, you are to be commended for your vision and all your hard work. And to the rest of the OWH team...you folks are the best of the best!! Lots of pride to go around today. LOL! Ok...didn't realize I was logged in to my husband Aaron's account. This is soooo AWESOME!!! I am so proud to be part of such an amazing group of selfless cardmakers!!! Amazing 1000000 - everyone should be so proud of their efforts - every card makes such a difference - remember that a million cards - probably means at least 3 million smiles - the cardmaker, the hero and the recipient of the card - no let's make that 10 million because I am sure the recipient looks at that card many times and smiles. What a wonderful accomplishment. Congratulations to everyone at OWH and all of the cardmakers who give of their time and talent. This is such a blessing to our heroes and their loved ones. wow! congratulations to all who were part of the first million. I hope many, like me, will be inspired to become part of the next million! Congratulations OWH!! It has been fun to be part of making this first million happen! I love making cards for our deployed heroes. It is so rewarding to read the comments from them and their families about how much the cards mean to them. 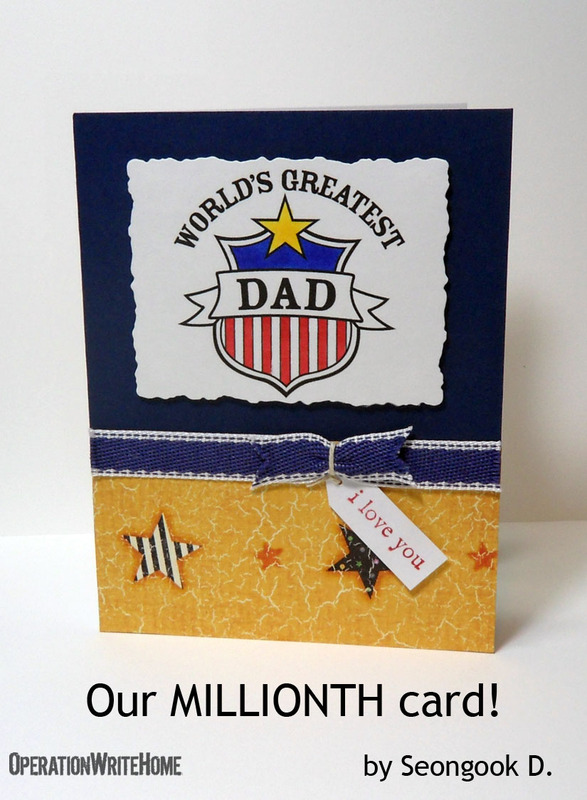 I am soooooooo excited to have made the Millionth Card for OWH. I do really appreciate for our heroes' services being away from their families to protect our freedom. Making cards for them is a small token of appreciation from my heart. Sandy, thanks for all what you do for our heroes and fellow OWH cardmakers with your constant inspirations. You are an amazing person. I want to give thanks to everyone of the OWH Cardmaking Party Group in Elk Grove/Sacramento, CA. Congratulations and thank you to all the Operation Write Home cardmakers! you can read about my own personal experience with a Marine who had apparently received donated cards to use and how touching it was to hear him send on his thanks. I love making cards for OWH and consider it an honor to support our troops in this small way. Oh my good gravy! What a milestone OWH has reached. Just goes to show you how much love there is all around us here in the crafting community. Keep up the great work! Awesome! There's no stopping OWH! What an accomplishment!! I﻿ am humbly proud to be part of such an incredible organization!! Thanks for letting me be involved, but most of all, thanks to ALL our military and their families!! I am so proud to be a small part of this wonderful organization! Here's to 2 million! What an exciting feeling to count up to the 1 Millionth card! Watching the video is so humbling, when you hear what these cards mean to family members of our heroes. I am so proud to be part of this organization. Hugs all around! God bless you for all of the wonderful work you do. You have blessed countless lives. what a wonderful achievement! It is true that each individual card touches so many people- a million cards... it is so hard to imagine the amount of happiness generated by all those cards! Rock on OWH! Woo-hoo! A million cards! What an awesome accomplishment. Way to go card makers! I'm so thankful for all our military heroes and their families. Knowing that a card I've created might bring a smile to a loved one's face makes it all worth while. My unit enjoyed receiving two full boxes of those wonderful homemade cards over here in Kabul, Afghanistan. It's amazing what you all are doing for us over here. Thank you so much for caring. This is such an amazing and wonderful accomplishment! Congratulations to all of the cardmakers. I am so proud to have contributed my very small group of cards to this huge effort! It is an amazing team and if we didn't have this team, it couldn't happen! Now I need to go and make more cards!! Cheers! Wow, one million! The video is amazing. I love seeing the pics and hearing the comments. I'm so proud to be part of this great organization. Even though our heroes deserve much more than this, I'm happy to be able to give just a little bit back. Whoo Hoo!! One Million!! That's a lotta of love packed in with those cards. I have a box about ready to send to Dixie soon. I have to do the tucking first!! It's great to be able to spread the word about this fabulous organization!!! Ever since my daughter was in Iraq, I realized just how important these cards are to our nation's heroes. It amazes me how such a simple thing like a card means so much to so many people. Congrats to all of the people that were involved in making the first million cards, and here's to looking forward to the second million! We can't thank our heroes enough, and since we love to make cards it's only fitting that they go to the people who are away from their loved ones the most. Hoo-ahh! This is awesome! Congratulations and THANK YOU for all of your work organizing this wonderful service to brighten the days of our military members and their families. I am so happy to be a part of this. Congratulations on One Million Cards. I am so glad to be a part of this and am honored to start working on Two Million Cards!!! Thank you OWH for all you do. Congratulations on the milestone! I'm posting from Ft. Riley, Kansas today. 2 brigades from Riley are currently deployed to Iraq and Afghanistan. Being here reminds me how important our mission is to those waiting for their heroes to return. I'm thankful our Soldier is safely home. Looking forward to making some cards and packing some boxes when I get home! A million cards! Wow! It's a joy to create cards for Operation Write Home, helping connect families and friends across many miles. Wow, I can't believe we hit the millionth card mark! When Sandy began this endeavor I would have said it would never happen. Guess dedication and perseverance proved me wrong! Congratulations so everyone involved with Operation Write Home. I have been making cards for Operation Write Home for the last six months and it is by far my favorite volunteering opportunity. Anyone can get involved- we need kids to color pictures, and adults to make cards, write letters, and contribute toward shipping costs. I know I'm making a difficult situation for many families just a little bit easier, and for that, I'm happy! Congratulations to OWH for sending it's first million cards. This is just awesome. I'm so proud to be part of this cause. Seeing the comments the families of the troops write and how excited they are to get cards from their deployed family members just makes me want to make more cards. Way to go to all the OWH cardmakers. Way to go OWH!!! A million cards, how fantastic is that! And to Seongsook Duncan - huge congratulations for creating that 1 millionth special card for our troops!! I'm proud to be a part of OWH and so proud of our military that gives unselfishly of themselves to serve our country! Long live OWH! I'll be making cards for them until the day our men & women in uniform all come home again! Congratulations to all our OWH card makers and to our wonderful hard-working shippers. It is great to be part of this effort...until they all come home! Yahooooooo we did it! Congrats to all the cardmakers and most of all to our hardworking, dedicated shippers!! Without them OWH would have never gotten to the MILLIONTH card. Just think of all the smiles, joy, love and tears that many cards represents. I'm proud and privileged to be part of something so awesome. I'll be making cards as long as our Hero's are deployed away from home and family. Thanks to all of them and their families for their service and sacrifice. I was hoping to be the millionth, but so glad you didn't wait for me!!! Working to get my Fathers Day batch in the mail tomorrow morning! What a blessing to use my stash to bring a smile and hug to those who give up so much for us! Congrats on this wonderful accomplishment!No matter how largeor or small each cardmakers contributions are just know that everyone has made a difference in the lives of our troops and our families.You've kept each and everyone of us going during such difficult times. Thank-you, thank-you, thank-you!!! What an amazing milestone!! I am so proud to have played a small part in it.I love that OWH is made up of talented, caring and generous cardmakers, as well as hard working and AMAZING shippers!! Let's work hard on the next million. amazing amount of cards..congrats to all the organizers AND the cardmakers! I am proud to be a contributer and will continue to do so and to spread the word! Congrats again on the one million, so happy I was a small part of it. Such a wonderful cause that helps 1000s of people both military and not by sharing our love of crafting. On to the 2nd million! wowee, this is such an amazing milestone, buig congrats and hugs to all! ( And I actually know who Seongsook is, her work is terrific, how cool it was her card!!) yippee! This is a great video, it made me teary, but also very proud to be a part of this and being able to keep families in contact with these cards, thanks for letting us all be involved! great job. congrats to all. WOW! ONE MILLION - I am amazed at the generosity and talent of the cardmakers. Sandy and shippers deserve a MILLION thank yous for what they do. Having been a deployed wife/mother and now a disabled veteran I know how much these cards mean to the troops and their families. I'm proud I am able to contribute to this wonderful act of patriotism and support. Sandy, Kris and Dixie are amazing! But so are all the cardmakers that participate in this wonderful organization. Good job everyone! Congratulations to all who made this possible! It took many hands to accomplish this and I'm proud to say I have been a small part of it. Thanks to everyone! I was able to have a card drive at a crop yesterday, Saturday the 14th. While educating the ladies on what OWH is all about I was proud to share this great news with them. . The audible gasp and applause over that millionth card was astounding and I know that it will only encourage more people to get involved. Congratulations OWH and everyone involved! I can't wait to get working on that next million!!! We did it!!! We're hard at work on our 2nd million. We all do this together and it's so rewarding to know that our heroes are able to stay in touch with their families at home. Proud to be a part of the group. What an accomplishment! It is exciting to know that I helped in a very little part to hit that goal. Many of you have been helping out with such generosity. I am excited about the second million!! One million cards! WOW! It is an honor to have a small part in recognizing our heros and making their worlds a little brighter. Thank you OWH for the chance to participate. oh, it is so fantastic to have reached 1 MILLION cards! What a beautiful card and it really touches me that this card will travel so far with so much good cheer! It really brings tears to my eyes when I think of all the people involved all around the world for just one card! How nice to be able to help our service members stay connected with their families. I feel so fortunate to be able to be a small part of this grassroots organization. Isn't it amazing how much we can accomplish when we all work together. Way to go cardmakers and shippers! Sharla V.. So happy for the one millionth card and so Proud to be a part of OWH. I am so proud to be part of the one million cards sent out to our troops, when my son and daughter joined the Marines I new I had to do something to help other families with sons, daughers, mothers, fathers and spouces so far away...WooHoo one million, outstanding Video Sandy.........Margie Cardmaker in Brentwood Ca. CONGRATULATIONS OWH! Here's to the next million! Amazing milestone! I am so happy to be a part of this effort and am so thankful for everyone's hard work and dedication to OWH. To show my appreciation I have a challenge that will post on my blog at midnight CST tonight. Come check it out! What an amazing feat! I'm proud to be part of this awesome effort. Wow! I think the last 250,000 came in much faster than the first 750,000 - Congratulations Operation Write Home and many thanks to all of the talented artist that have made this possible. A faszinating effort - well done! 1800 cards made at McGraw-Hill Global Volunteer Day at Scrapbook Art in Central Ohio to kick off the next 1,000,000! Proof that God's dream for us is far greater than our dream for ourselves. Well done, Sandy and OWH Family. What a wonderful way to honor our troops.